Travel back in time 150 years and retrace a portion of John Wesley Powell’s historic first descent of the Green and Colorado Rivers. Joining the full expedition to provide commentary and a compelling backstory to this once-in-a-lifetime river adventure is resident historian and geologist Dr. Michael P. Ghiglieri. One of OARS’ original guides, Ghiglieri has run more than 680 river trips on 40 different stretches of river and he’s written several books, including First Through Grand Canyon—an evocative read that pieces together the secret journals and letters of the 1869 crew who first explored the rivers of the Colorado Plateau alongside Powell. Your adventure begins at Desolation Canyon, where the canyon walls will soar up to the sky above you, in some places rising higher than the walls of the Grand Canyon at the Bright Angel Trail. This stretch of river boasts more than 50 splashy Class II-III rapids along with peaceful stretches inspiring contemplation of those who have made the journey before you. As the expedition continues, you’ll continue to ride the mighty Green as it forges its way through Gray, Labyrinth and Stillwater canyons on the way to the confluence with the Colorado River. You’ll explore the wild heart and red rock wilderness of Canyonlands National Park, enjoying the pristine beauty of remote canyons, Ancestral Puebloan ruins, petroglyphs, pictographs and fascinating geology. In Cataract Canyon, the journey culminates with some of the most legendary whitewater in the country. The Colorado is mostly undammed above Cataract Canyon; thus, varying water levels at different times of the year provide a whitewater experience for everyone. Seasons experiencing average and/or above average snow packs will likely see highwater in May and June. Outside of high-water, it is a great family-friendly run, with less intimidating rapids suitable for most ages and all levels of experience. 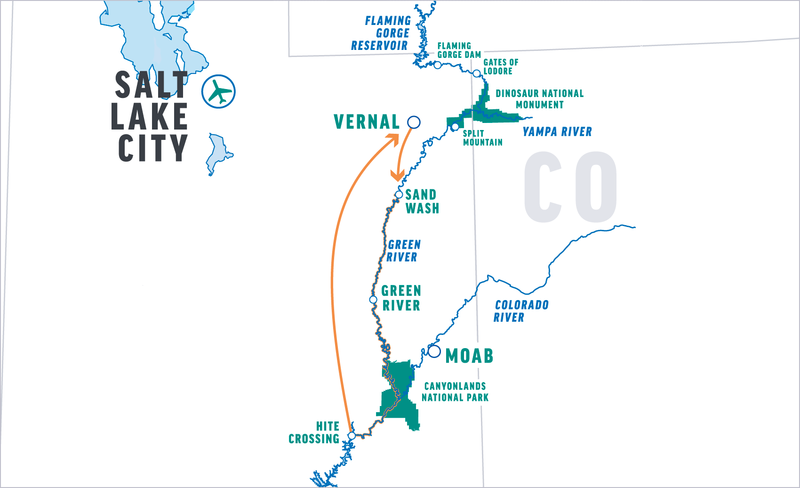 Finally, after spending time on the storied waterways of the West, a scenic flight back to Vernal will give you some time to reflect on your epic journey tracing John Wesley Powell’s footsteps. We’ll meet at 7:00 PM at the OARS Warehouse in Vernal, Utah, for a pre-trip meeting. This is an opportunity to meet your fellow travelers and trip leader and ask any last-minute questions. Your trip leader will give you a thorough trip orientation, and pass out your waterproof river bags so that you can pack your belongings that evening. We begin our trip with a shuttle ride from Vernal to our put-in at Sand Wash.
After a thorough safety talk, we will begin our descent to the Green River. Wear your hiking shoes today as we will hike 1.5 miles down into the canyon, where our boats are waiting. OARS crew will transport all gear in vehicles, so guides and gear will be ready to take off upon our arrival at the river’s edge. We will then board the boats and begin our journey. The trip begins on a calm stretch of the Green River. Depending on water levels, we may use the motor assist today as we have many river miles to cover before reaching camp. This is the perfect opportunity to take in the gorgeous canyon scenery and become acclimated to your boats, guides and fellow travelers. At lunchtime we pull over to a sandy beach and enjoy a delicious picnic. After feasting and relaxing on the beach, we get back in our boats and watch the desert panoramas slowly develop as we head for our evening camp. Late-afternoon, we stop and make camp. You’ll grab your bags and set up your tent while the guides take care of the kitchen and “living room”—camp chairs and possibly the night’s campfire (if permitted). This is the perfect time for you to lounge on the beach with that book you’ve wanted to finish forever. Before long, you’ll be savoring pleasing hors d’oeuvres and the beverage of your choice—delicious as these refreshments are, they always taste better after a day on the river! Nap, take an exploratory hike, or just sit back and laugh with friends and family as we prepare dinner. After a satisfying feast, the evening is yours to spend however you wish. Maybe music, stories or jokes will bring us together tonight; maybe the popping of the fire, the whisper of the river and the clarity of the big, star-filled sky will encourage silent reflection on the amazing wilderness that is, for now, our home. Your days begin as the morning light paints the canyon walls with brilliant shades of desert colors. Fresh coffee and tea are waiting for you when you get up; grab a cup, sit back and take in the glory of the awakening river. Soon breakfast is served, and once you’ve eaten your fill, you’ll pack up your things as the guides break down camp. Then our new day’s adventure begins! This portion of the river was home to the ancient Fremont Indians. Throughout our journey, we may stop to see thousand-year-old ruins or intriguing petroglyphs. After thrilling rapids, we stop for a hike. Outlaw history abounds in this remote part of the Green River, and we may even check out an abandoned ranch where Butch Cassidy’s Wild Bunch spent their evenings. We encounter 90 million years of geologic time as we float through this deep canyon. The whitewater increases with each passing day through the canyon. Through this section of the river, you will encounter 50 Class II-III rapids, including Cow Swim, Three Fords and Coal Creek to name a few. We’ll check into our accommodation for the night at River Terrace, in Green River. The late afternoon is free for you to relax or explore the John Wesley Powell Museum, reconvening for a group dinner at Ray’s Tavern, a favorite among local river runners. Once we meet the Confluence, it will lead us through Labyrinth Canyon and Stillwater Canyon. We may explore many magnificent gorges in side canyons such as Three Canyon, hike up to the River Post Office or discover the secrets hidden in Two Mile Canyon, Fort Bottom, Shot, or Water Canyon. We might stop to hike to ancient granaries, thousand-year-old ruins and intriguing petroglyphs or a Denis Julien inscription, an explorer who traversed this area even before Powell and his crew. After the Green winds us through convoluted twists and turns we happily reach the Confluence. Now that the waters of the Colorado River join our party, Cataract Canyon begins, hinting at the whitewater to come. In a slow mix, the murky waters of the Colorado take some miles before they overtake to the often clearer Green. As we leave Stillwater Canyon, the Green’s 730+ mile journey from Wyoming continues on what is now the Colorado, mightier than before. Our anticipation grows. Next up are the legendary rapids of Cataract Canyon like Mile Long, Capsize and the Big Drops – this section offers plenty of excitement. As we drop into Brown Betty Rapid, the preceding days’ anticipation of Cataract explodes in cool water and huge smiles. Whatever the water level or the type of boat you’re in, the rushes of adrenaline with each new rapid are balanced by the knowledge of your guides’ experience. On the last day, Cataract Canyon ends as we reach the old location of Hite that was flooded by Lake Powell. As we journey out on the reservoir toward Hite Crossing, it’s tough not to imagine the wonders drowned below us. What more could Glen Canyon have shown us! The bittersweet ending is now here. Thankfully, the scenic flight back to Vernal grants a bit of time to reflect on our days retracing John Wesley Powell’s epic journey. Wetsuit–weather dependent (does not include wetsuit booties or footwear of any kind). The day before your trip we will meet at 7:00 PM at the OARS Warehouse for a pre-trip meeting. Your trip leader will provide a thorough trip orientation and pass out your waterproof bags so you can pack your belongings that evening. The trip leader will also reconfirm the meeting time for the following morning and give you an opportunity to ask any last-minute questions. From Salt Lake City, Utah (3.5 hours, approximately 173 miles) take Hwy 80 east to Vernal. Follow I-80 east and US-40 east to Vernal. As you approach from the west on US-40, turn north at the center of Vernal on US-191. Go two blocks and turn right on 200 North. Proceed four blocks to 400 East, turn left and drive two more blocks to get to the warehouse, which is on your left as you pull in. From Grand Junction, Colorado (3 hours, 20 minutes, approximately 142 miles); head west on Interstate I-70 to CO-139. Travel 73 miles north to CO-64 and turn left (west) toward Rangely, CO. Continue on CO-64 to Dinosaur then west on US-40 to Vernal. In Vernal, turn right on N 500 E, go two blocks north, then turn left on E 200 N. Turn right on N 400 E after one block into the OARS parking lot. Commercial flights are available into Salt Lake City and Vernal, Utah, or Grand Junction, Colorado. On the final day of your river adventure, you will be returned to the OARS Warehouse. You should arrive back by approximately 4:00-6:00 PM. The Green River offers splashy Class II rapids and thrilling Class III rapids, interspersed with miles of smooth water that inspire swimming, watching for wildlife, and gazing at the canyon scenery. Despite these slower stretches, there are several fun stretches of whitewater on the Green. You’ll challenge minor rapids plus dozens of smaller waves and riffles. The Green River is calm before merging with the Colorado River in Canyonlands National Park. The Colorado River is not dammed above Cataract Canyon, and its varying water levels at different times of the year provide a whitewater experience for everyone. In the high-water season of May and June, experienced whitewater enthusiasts delight in the huge waves and the famous “Big Drops,” which at times can make even the Grand Canyon’s Lava and Crystal Rapids seem tame. This is some of the biggest navigable whitewater in the U.S. at peak flows. Outside of high-water, it is a great family-friendly run, with less intimidating rapids suitable for most ages and all levels of experience. Some beers (3.2% alcohol by weight) are available in grocery stores. For other beer, wine and liquor you will need to go to the Utah State Liquor Store. The hours are 11:00 AM to 7:00 PM Monday – Saturday in the spring and 11:00 AM to 9:00 PM Monday – Saturday in the summer. They are closed on Sundays and holidays, including Pioneer Day (June 24). For further information and to check what beverages are available, please visit their web site: abc.utah.gov/stores/. Each day varies, but on an average you’ll spend 4-8 hours a day on the boats. The rest of the time will be spent hiking and exploring, eating, or just relaxing in camp. We generally plan at least one guided hike each day, depending on conditions. There is ample opportunity for the curious to explore the area at length. Please let your trip leader know if you are an avid hiker and remember to bring extra water bottles and good shoes. Remember, however, that all hikes are optional and you can choose to lie on the beach and take in a few tanning rays or read a book instead. Lastly, the Trip Leader must consider to overall ability of the group when deciding what hikes to offer. You can obtain a Utah fishing license at www.wildlife.utah.gov/fishing/ or at the Vernal Wal-Mart (435) 789-9784, which is a 5-minute drive from the OARS warehouse. You need to bring your own fishing gear. Please bring your rod in a protective hard case. Bathing is allowed in the Green and Colorado Rivers, but must be done with biodegradable soap. It is not, however, allowed in any of the side streams that feed into the river. If you plan to bring soap, we recommend Campsuds or Dr. Bronner’s, which can be purchased in most stores that have a camping section. Disposable anti-bacterial towelettes (Coleman Swash Cloths, baby wipes, etc.) are good alternatives to submersion in the river and are especially convenient. *The use of drones is prohibited by the National Park Service and the Bureau of Land Management while on the river. Once you are on the river there is limited communication with the “outside world.” Cell phone service is not available. Our guides carry satellite phones which are strictly used to call out in case of an emergency situation on the river. They can call out, but we cannot call them. Periodically the trip leader will check in with our office. If you have someone that needs to contact you about an emergency at home, they should call our office (800-342-8243). If possible, we will relay the message to you. Keep in mind, however, it could be several days or longer before the message actually reaches you. For your family at home you should define for them what you consider an emergency and provide them with instructions to call our office in the event one occurs during your vacation. You may want to check one week prior to your trip for an up-to-date weather forecast. We recommend the following website: www.wunderground.com for weather in Vernal, UT. The respective flow on the Green River is the story of human impacts on a very distinct watershed. The Green River’s headwaters lie in the Wind River Range of Wyoming, and its stream is repeatedly blocked and diverted, most sizably by the Flaming Gorge Reservoir, not far upstream from Dinosaur National Monument. Thus, its flow is determined by reservoir releases. The Green also will spike in the spring and early summer as the controlling agency at Flaming Gorge Dam releases water to make room for inflow. Peak releases from Flaming Gorge on the Green usually occur between mid-May and mid-June, but can vary widely from early May and into July. The Green River continues on until the confluence with the Colorado River. The flow of the Colorado River through Cataract Canyon is generally unregulated, meaning no single reservoir controls the water level. Peak run-off through Cataract Canyon usually occurs between mid-May and mid-June, but can vary widely from early May and into July. High water trips equate to a more intense whitewater experience and a high level of physical fitness is recommended. Water temperatures are coldest during the high water period and rain gear and warm synthetic clothing will be required. In reality the water is quite cold even in the summer, but lower flows and warmer air temperatures mitigate the risk of hypothermia. Ability to remain seated and balanced while in a whitewater craft. Ability to independently swim in whitewater or swift currents. This includes being an active participant in your own rescue, including having the ability to (a) keep your airway passages sealed while underwater, and regain control of your breathing when being submitted to repeated submersion under waves or currents; (b) orient yourself to new “in-river” surroundings; (c) reposition yourself in the water to different swimming positions; (d) swim aggressively to a boat or to shore in whitewater; (e) receive a rescue rope, paddle, or human assistance, and possibly let go of the same; (f) get out from under an overturned boat. Ability to swim 100 yards in flat water. The following paragraphs are meant to further inform all potential participants of the expectations for all participants in order to promote a safe, enjoyable experience for everyone on a trip. There may be requirements, whether physical or mental, that are not specifically applied “essential eligibility criteria,” but that help our guests understand the reality of being on a wilderness river trip. River trips, particularly those involving whitewater, are inherently risky. While the risk of a trip is part of what makes it an exciting adventure, you must be entirely respectful of the risk that such a trip poses. It is important that you are confident in your swimming ability, and your ability to stay calm in the event you become a non-voluntary swimmer. Your odds of becoming a non-voluntary swimmer change with the classification of a rapid, boat selection and environmental factors. On Class IV and greater whitewater, the probability that you will become a non-voluntary swimmer is significant. A swim in whitewater is much more difficult and physically draining than swimming in flat water. Swimming in cold water can cause a gasping effect on your respiratory system. This can be overcome by focusing on your breathing and calming yourself down. Swimming in cold water will also much more quickly sap your energy and decrease muscle function than swimming in warmer water. While our guides are highly trained and will do their absolute best to rescue you, a successful rescue is greatly hampered by a swimmer who is unprepared for a swim in whitewater, who fails to actively participate in their own rescue, and who is not able to follow directions while under stress. You will receive a detailed orientation talk at the start of your river trip, but you can get a better idea of what to expect by watching a version of an orientation talk here: https://www.oars.com/experience/safety/. In camp—We recommend wearing shoes in camp due to risk of kicking a rock buried in the sand or stepping on a sharp stick. The athletic shoes or light hikers you bring for hiking can double as your camp shoes. It’s nice to put on dry socks and shoes after a day on the water. Flip flops or slip-on sandals are OK for wearing in camp only. Please note: If you buy new shoes or sandals for the trip, make sure you break them in first! June Trips: This is surely one of the most beautiful months to be on the Green River, but June can also produce some surprisingly chilly times. During the spring, the sun is not far enough North in the sky for its warming rays to reach down into the river canyon for as many hours a day as it does in the summer. This means more shady areas, fewer sunny ones. Therefore, when you are splashed (drenched) going through the rapids and you’re in a shady area, you will get very cold unless you are prepared. Bugs and mosquitoes can be very bothersome at times in certain areas on the Green and Colorado, particularly after high water drops. Though this happens at different times every year, it is typically in June to mid-July. It’s a good idea to come prepared with insect repellent and a head net. Long sleeved shirts and pants may be desirable at times. We supply a professionally laundered sleeping bag, sheet, a pillow with a freshly laundered pillowcase, a sleeping pad, a ground tarp as well as a shared tent. The complete customized sleep kit that we provide is designed for your comfort and maximizes available luggage space. Our sleeping bags are degree rated depending on the season and are 33” x 84,” which is longer than the normal (80”). At the pre-trip meeting each person will be given one large waterproof bag (approximate sealed size: 13” diameter x 25” tall; 3318 cu in; 54.4 L), for your clothing and personal items. A second bag for your sleeping gear (sleeping bag, sleeping pad, ground tarp, sheet and pillow) will be packed and waiting for you. These two bags will be your “checked luggage” and will only be accessible in camp. Tents are stowed separately. We also provide a small waterproof bag for day use where you can keep items such as raingear, camera, sunscreen, lip balm, etc. (approximate sealed size: 17” tall x 9” diameter; 1081 cu in; 17.7 L). The bags are cylindrical in shape and pack from the top. Please pack light, and keep in mind that river attire is casual: comfort, convenience and boat space take precedence over style. At the end of the trip, you will return to Vernal with your waterproof bags, where you will be able to unpack your gear before your trip home. We recommend you take on the river only what’s absolutely necessary. Keeping gear to a minimum insures it will fit into the waterproof bags we supply and reduces unnecessary packing and unpacking in camp. If you do have extra luggage that you need to store, you may keep it locked in your car or you may be able to store it at the hotel you are staying at. We recommend that you leave your valuables at home. For personal items like wallets, purses and cell phones, we recommend putting them in a zip-lock bag at the bottom of your waterproof bag with your clothing. A $1000/person deposit is required at the time of booking. Deposits may be made by check, money order or Visa/Mastercard (American Express and Discover incur a 3% processing fee). Receipt of the initial deposit signifies acceptance of our complete Terms and Conditions. Individual departures and trip capacity are strictly limited by the managing agency. Cancelling your trip will incur cancellation fees because holding spots for you means we are likely turning others away who would like to book the trip. Final payment is due 90 days prior to departure. Accounts on which final payment has not been received 80 days prior to the departure date will be cancelled without exception. *If we are able to fill the trip and replace the cancelled passengers, the fee will be reduced to $250/person. If you transfer from one trip to another within the same season, there is a $25/person fee up until 120 days prior to departure. You may choose to make a one-time transfer of your payments to a credit account for use during the following season, which incurs a $50/person fee up until 120 days prior to departure. Transfers made after this time will be treated as cancellations.